How can I upload .csv or excel files existing in computer to RStudio cloud? or in read.csv() how the address of a file to be read is given, when uploading file from PC to RStudio.cloud? 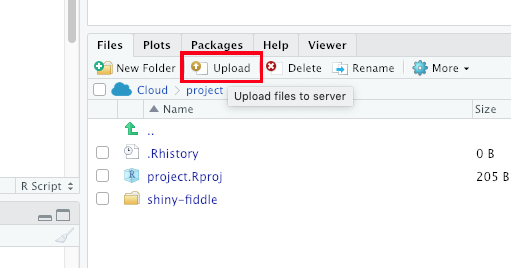 In your rstudio.cloud project, you can upload files via the Upload button in the File pane. You can upload a group of files by zipping them up together into a zip file first. May I know if I can browse file location on my PC through command line in RStudio cloud ? You cannot browse your local system from cloud through the command line. If you need local file(s) you would upload it to cloud using the command that Curtis pointed out and then interact with them in cloud afterwards.